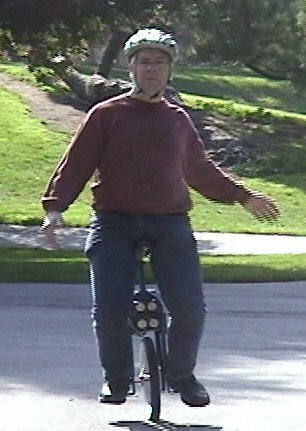 The Eunicycle balances itself using a feedback loop between a solid-state gyroscope and the wheel motor. When the rider tilts forward, it runs the wheel forward to keep balanced; about 200 updates per second make for a smooth ride. Check out this cool Eunicycle video (14 Mb) on his Eunicycle page. Dr. Blackwell states that it does take some practice to ride comfortably. His posture in the photo shows the use of arms to keep balanced side-to-side; steering is accomplished by swiveling hips and arms. There is an amazingly close correspondence between the Eunicycle and a device that Robert Heinlein wrote about in his story The Roads Must Roll. The tumblebug is a handy scooter used by engineers when troubleshooting problems on the rolling roads.